The beautiful Kangra valley starts near Mandi, runs north then bends east and extends to Shahpur near Pathankot. To the north the valley is flanked by the Dhauladhar mountain range to whose side Dharamsala clings. There are a number of places of interest along the valley, including the popular hill station Dharamsala. The main Pathankot-Mandi road runs through the Kangra Valley and there is a narrow gauge railway line from Pathankot as far as Jogindernagar. The Kangra school of painting developed in this valley. There is little to see in this ancient town, 18 km almost directly south of Dharamsala, but at one time it was a place of considerable importance. The famous temple of Bajreshwari Devi was of such legendary wealth that every Invader worth his salt took time to sack it. Mahmud of Ghazni carted off a fabulous fortune in gold, silver and jewels in 1009; in 1360 it was plundered once again by Tughlaq but it was still able to recover and, in Jehangir's reign, was paved in plates of pure silver. The disastrous earthquake which shook the valley in 1905 destroyed the temple which has since been rebuilt. Kangra also has a much ruined fort on a ridge overlooking the Baner and Manjhi rivers. It too was sacked by Mahmud and severely damaged in the 1905 quake. Kangra has a PWD Rest House. 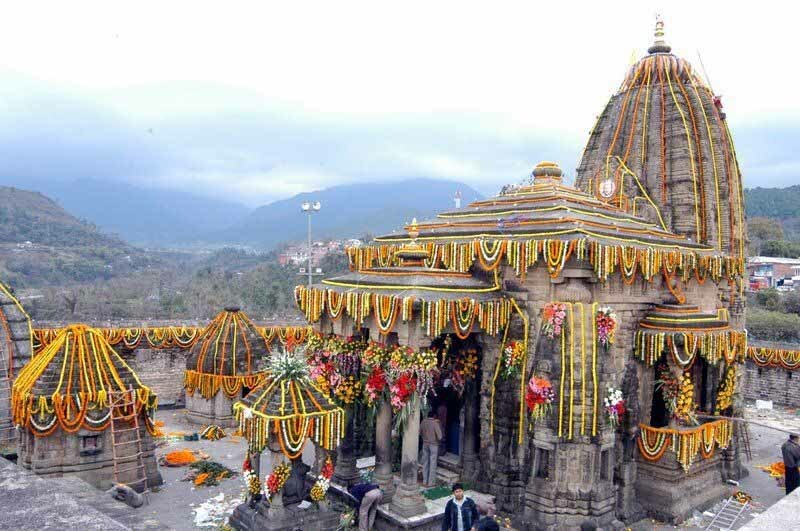 In the Beas valley, 34 km south of Kangra, the temple of Jawalamukhi is famous for its eternally burning flame. 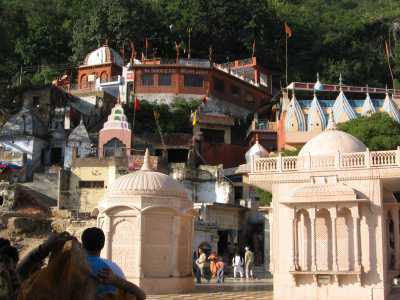 It's the most popular pilgrimage site in Himachal Pradesh. Jawalamukhi has a PWD Rest House and there is another pleasant rest house at Nadaun, south of Jawalamukhi on the Beas river.Important (but failed) negotiations between would-be Indian and Pakistan leaders. 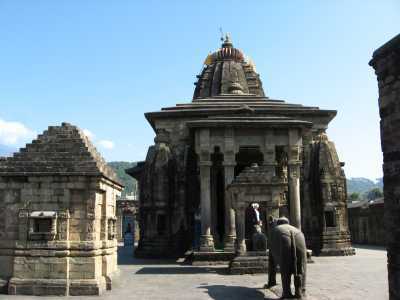 Only 16 km from Palampur the small town of Baijnath is an important pilgrimage place due to its very old Shiva temple. The temple in said to date originally from 804 AD. There is a PWD Rest House in Baijnath. 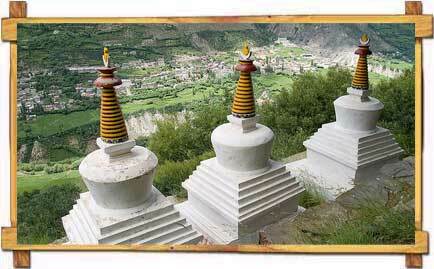 Near Bharwain, 80 km south of Dharamsala and across the Beas, this town also has an important temple. 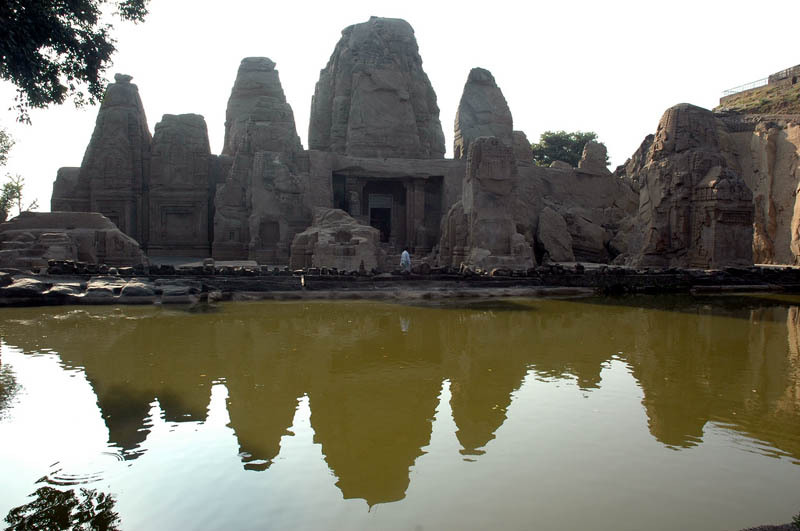 Situated three km from Haripur, about 15 km south of Kangra, there are 15 rock-cut temples here. In the Indo-Aryan style and richly carved they are now partly ruined but still show their relationship to the better known, and much larger, temples at Ellora in Maharashtra. A pleasant little town surrounded by tea plantations, Palampur is 35 km from Dharamsala and stands at 1260 metres. The main road runs right through Palampur and there are some pleasant walks around the town. Only 24 km from Pathankot on the main Mandi-Pathankot road, the town acquired its name in 1622 when Jehangir named it after his wife, Nurjahan. Nurpur fort is now in ruins but still has some finely carved reliefs. 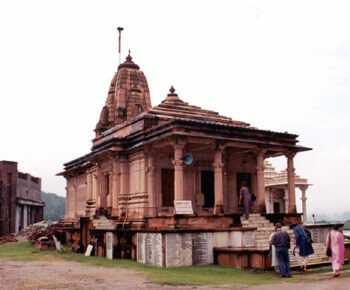 A ruined Krishna temple, also finely carved, stands within the fort. Nurpur has a PWD Rest House. From Baijnath you can make an interesting trek to Dharamsala, Chamba or Manali. The first day's trek to Bir Khas can be done by bus. At Bara Bhangal, reached on Day 6, you can choose to go east to Manali or west to Dharamsala or Chamba. Alternatively you can turn east and a day's trek will bring you to the Manali Pass treks described under 'Treks from Manali'. There are a number of possible routes down to Manali.